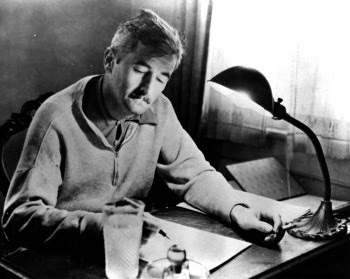 The University of Virginia has made available online quite a few bits of audio (with transcripts) from 1957 and 1958 when William Faulkner was UVA's very first Writer-in-Residence. It's a thrill to hear his voice. The whole Faulkner at Virginia collection is searchable by keyword. Unidentified participant: Is the present movie a compilation of various episodes in different novels? For in—I'm thinking of the horse particularly. Did that come from the "Spotted Horses," that's so much like it? William Faulkner: I don't know, ma'am, because I'm not a moving picture-goer. I haven't seen [the movie]. [audience laughter] I really don't know. My experience with moving pictures is that they have almost any reason for buying the book except to make it. [audience laughter] I remember M-G-M bought a book of mine called The Unvanquished. They were stories of the Civil War. I found out later that a producer named Selznick had bought Gone With the Wind, and he wanted to use Clark Gable in the picture, but Clark Gable belonged to M-G-M, and M-G-M wouldn't let Mr. Selznick have Clark Gable unless Mr. Selznick let M-G-M make the picture, which Mr. Selznick wouldn't do, so M-G-M hunted around for another book to buy of the Civil War to tell Mr. Selznick they were going to make a Gone With the Wind themselves if he didn't let them make his, so they bought my book with no intention of making it. [audience laughter]. One gets the feeling that if we had the resources to examine every case of a so-called Black Confederate in detail, their phantom numbers would be reduced from the 10s of thousands that certain neo-Confederates dream about, to about seven or eight. And even those seven or eight would have mitigating circumstances governing their service. 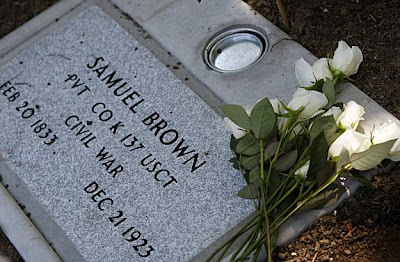 The record of one of those soldiers was set straight in Vallejo, California this weekend, when a former slave turned Federal soldier, Samuel Brown, got a new headstone. The original one mistakenly identified this member of the 137 USCT as a Confederate infantryman. 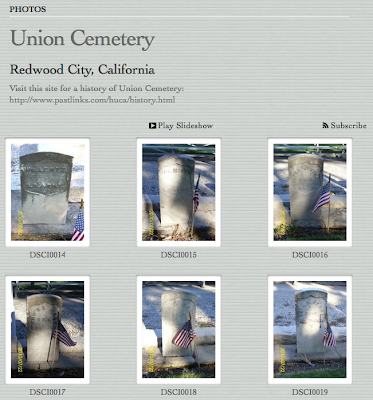 Click on the image below to see individual photos of the grave markers. I'll add a roster and transcript of the tombstones later, since some are hard to read in the photographs. 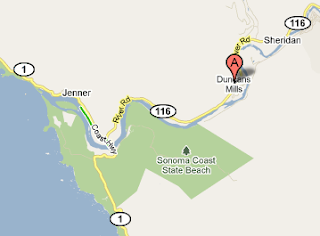 On the Russian River, just upstream from Jenner—that Battle of Duncan's Mills. As a San Francisco Bay Area resident, and a self-annointed Civil War blogger, I was interested to see that one of the fresh-faced bloggers over at sfgate.com (the online presence of the slowly vanishing San Francisco Chronicle, and a site I depend on daily) chose to write on her visit to a Civil War reenactment. The author of the blog considers a Civil War reenactment to be an exceedingly unusual novelty—she enjoys "highly specific weird subjects," she announces up front—but young urbanites are not expected to be aware of the surprisingly large number of regular reenactments that take place across the state, and which have been going on for decades in some cases. When I spent most of my 20's and early 30's in San Francisco, I became aware of the annual event at Roaring Camp in the Santa Cruz mountains, complete with a steam locomotive transporting troops in open cars, only because I was fully plugged into the all-but-invisible community of Civil War nerds in the Golden State after attending a Civil War conference in San Diego in the late 80's. It's true. In the prime of life, I travelled to the wonderland of San Diego specifically to spend the weekend in a Holiday Inn listening to hours of talks on things like "Berdan's Sharpshooters." I make light of it, but it was a seminal weekend, ultimately leading to a 16-year career in publishing, and other things. 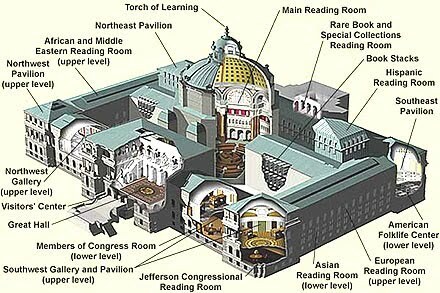 . . That's where I first met Ted Savas, Jerry Russell, Bob Younger — William C. "Jack" Davis was the featured speaker, and he was tremendously inspirational, and hilarious. . . But I digress. That is what history majors do, if they're like me. They look at a landscape or a cityscape and imagine it the way it was before, always daydreaming in one little pocket of the mind (and reserving one pocket of consciousness for coherent answers to companions). But time travel knows no bounds. I also look at San Francisco and see the wind-swept dunes of a virgin peninsula, the Portolla expedition first sighting the bay from land on the high ridge overlooking SFO, and I try to picture where serpentine was before it got thrust up on top. 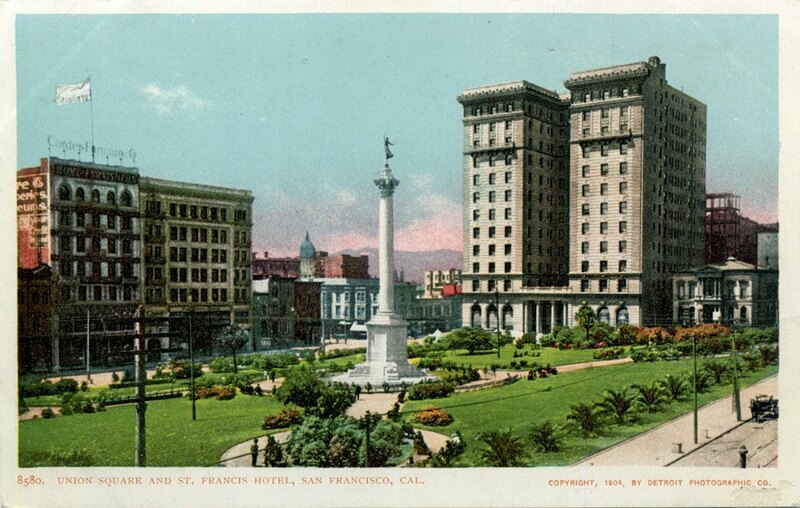 It's why every year I order the Anchor Steam calendar for my cubicle, to stare at beautifully reproduced works from Bancroft showing views of the city that exist only that artist's historic view. . . But I digress. It just occurred to me that I should invite the blogger, Ms. Spotswood, on my next Civil War San Francisco tour. Nowadays the state is lousy with reenactments. 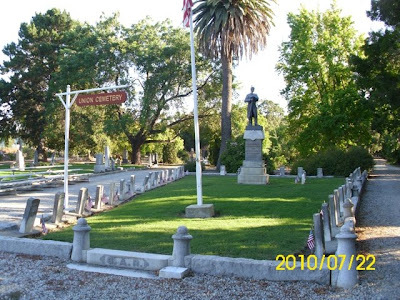 And it's not uncommon to encounter some kind of "Civil War Days" event in any obscure location from one end of the state to the other, from McCloud in the north, to Fort Tejon in the south. Our Culture Blogger did an adequate job conveying what happens at events like this. I read it with bated breath, because invariably these kinds of pieces include some choice quotes from a member of the southern camp who takes pains to explain that the war was not over slavery, but states rights (see Claude of the Turbervilles, an earlier blog post). Mercifully, though the most quoted reenactor was on the southern side, the blog entry was entirely free of Lost Cause mythology. I feel like sending a thank you note for that alone. Other miscues are not so egregious. Saying this reenactment was "3,000 miles from any actual Civil War experiences" did cause me to wince just a little. Even if we disregard the Civil War garrisons in California, or the fighting in Arizona and New Mexico, even if we disregard the experiences of those Civil War soldiers sent to fight the Sioux in the Dakotas, it's less than 2,000 miles to the battlegrounds of Oklahoma, Kansas, Missouri, and Arkansas. Who am I kidding? Yes, you're right, it's nearly 3,000 miles from Sonoma County to Gettysburg, the only battle of the Civil War. To be fair, what with the Sierra and the Rockies blocking the way, everything on the other side of the mountains might as well be 3,000 miles distant. 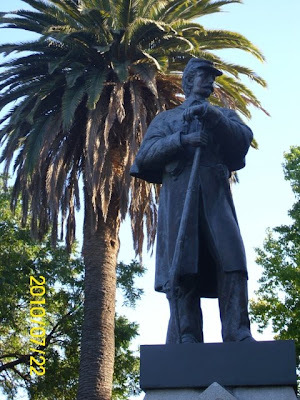 Speaking of local celebrations, the town of Pleasanton, California—one of Money magazines top 100 places to live—used to incorporate some Civil War stuff into one of their annual celebrations. I used to know the man who dressed up as General Alfred Pleasonton, the late, great Ormond Eckley, who started a CWRT in that area. To me the town will always be most notable for a misspelling (others may remember it as the background for "Rebecca of Sunnybrook Farm"). John H. Kottinger, an 1851 pioneer in the area, named the town in 1867 after Pleasonton, under whom he'd served in the Mexican War. When the post office was established June 4, 1867, a clerical error (it is believed) changed the name to Pleasanton. An 1898 Postal Guide set the record straight again, but in time, the error crept back into the books [this according to Kyle's, Historic Spots in California, and Gudde's, California Place Names]. Apparently, when one comes across the name Pleasonton, there's an irresistable urge to fix it. Could be worse. At least they didn't spell his name wrong on his tombstone. 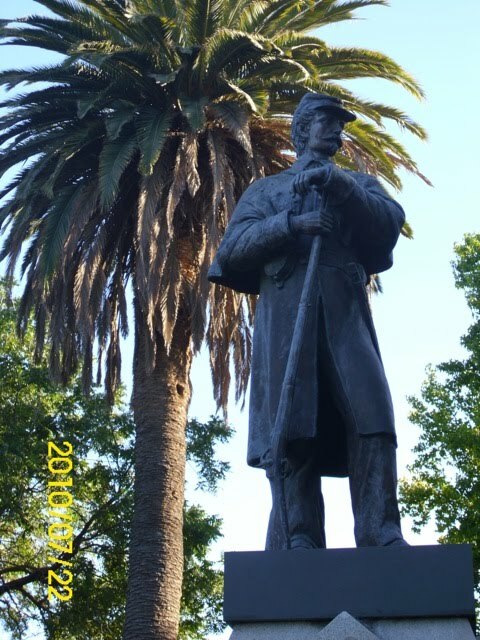 See General Irwin [should be Irvin] McDowell's grave in San Francisco's Presidio National Cemetery. We've all seen the stats. Time and again you come across them. And yet, every time you take a moment to consider them thoughtfully, they seem even more remarkable. At least 620,000 soldiers lost their lives in the war, 2 percent of the American population in 1861. If the same percentage of Americans were to be killed in a war fought today, the number of American war dead would exceed 6 million. The number of casualties suffered in a single day at the battle of Antietam on September 17, 1862, was four times the number of Americans killed and wounded at the Normandy beaches on D day, June 6, 1944. More Americans were killed in action that September day near Sharpsburg, Maryland, than died in combat in all the other wars fought by the United States in the 19th century combined. When anyone can be a published author. . .
How do you find something good to read in a brave new self-published world? Readers themselves rarely complain that there isn't enough of a selection on Amazon or in their local superstore; they're more likely to ask for help in narrowing down their choices. So for anyone who has, however briefly, played that reviled gatekeeper role, a darker question arises: What happens once the self-publishing revolution really gets going, when all of those previously rejected manuscripts hit the marketplace, en masse, in print and e-book form, swelling the ranks of 99-cent Kindle and iBook offerings by the millions? Is the public prepared to meet the slush pile? You've either experienced slush or you haven't, and the difference is not trivial. People who have never had the job of reading through the heaps of unsolicited manuscripts sent to anyone even remotely connected with publishing typically have no inkling of two awful facts: 1) just how much slush is out there, and 2) how really, really, really, really terrible the vast majority of it is. Civilians who kvetch about the bad writing of Dan Brown, Stephenie Meyer or any other hugely popular but critically disdained novelist can talk as much trash as they want about the supposedly low standards of traditional publishing. They haven't seen the vast majority of what didn't get published—and believe me, if you have, it's enough to make your blood run cold, thinking about that stuff being introduced into the general population. . . . If anyone can "publish" by forking over a few bucks to produce a paperback or e-book, then doing so won't be any more special than, say, printing out the manuscript on your Deskjet and running off a few copies at Kinko's. Readers will be saved from wading through slush by amateur authorities—bloggers and other pundits specializing in particular subjects or genres—who will point their followers to the best books. "People will find new ways to decide which books merit their attention." Recalling Longstreet's Assault 147 years ago today—also known as the Pickett-Pettigrew-Trimble Charge, also known as Pickett's Charge—I revisited an old but still worthwhile site, Behind the Stonewall, 360-degree Panoramic Images from Civil War Battlefields. It's "dated" technology, the images are small and the resolution could be better, but it's still unique, pretty thorough, and FREE. Here is the menu of Gettysburg panoramas. Here is the one next to the Copse of Trees, which the Confederates targeted in their long march. 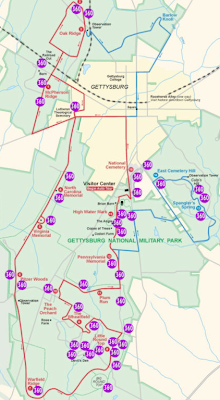 Virtual Gettysburg is a nice site, with better images and a large sampling of some of their tours, but you'll need to purchase the CD-ROM set to enjoy the fruits of what looks like considerable labor. 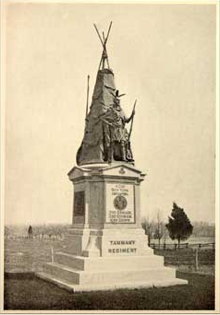 A really nice feature there is the database of battlefield monuments, which you can browse at random, or search for in detail. Looking for that teepee monument? There it is, the 42nd New York Infantry, south of the copse of trees. Another favorite Gettysburg site is Gettysburg Daily, where you'll find outstanding photographs, and expert captions and essays with a new post every day. If you're really captivated by Gettysburg and wish to explore the topic with a community of well-read devotees, check out the Gettysburg Discussion Group. Sign up for the regular emails or the digest—the traffic there is steady, and so there's always something new to read in ongoing conversations. Send them a few bucks to help maintain their servers, and take advantage of expertly-led, GDG-sponsored tours. There are some good resources at the NPS official site as well. an account from the officer holding the left flank of the Union line at Gettysburg. . . In compliance with the request of the colonel commanding the brigade, I have the honor to submit a somewhat detailed report of the operations of the Twentieth Regiment Maine Volunteers in the battle of Gettysburg, on the 2nd and 3rd instant. Having acted as the advance guard, made necessary by the proximity of the enemy's cavalry, on the march of the day before, my command on reaching Hanover, Pal. , just before sunset on that day, were much worn, and lost no time in getting ready for an expected bivouac. Rations were scarcely issued, and the men about preparing supper, when rumors that the enemy had been encountered that day near Gettysburg absorbed every other interest, and very soon orders came to march forthwith to Gettysburg. My men moved out with a promptitude and spirit extraordinary, the cheers and welcome they received on the road adding to their enthusiasm. After an hour or two of sleep by the roadside just before day break, we reached the heights southeasterly of Gettysburg at about 7 a. m. , July 2. Massed at first with the rest of the division on the right of the road, we were moved several times farther toward the left. Although expecting every moment to be put into action and held strictly in line of battle, yet the men were able to take some rest and make the most of their rations. Somewhere near 4 p. m. a sharp cannonade, at some distance to our left and front, was the signal for a sudden and rapid movement of our whole division in the direction of this firing, which grew warmer as we approached. Passing an open field in the hollow ground in which some of our batteries were going into position, our brigade reached the skirt of a piece of woods, in the farther edge of which there was a heavy musketry fire, and when about to go forward into line we received from Colonel Vincent, commanding the brigade, orders to move to the left at the double-quick, when we took a farm road crossing Plum Run in order to gain a rugged mountain spur called Granite Spur, or Little Round Top. The enemy's artillery got range of our column as we were climbing the spur, and the crashing of the shells among the rocks and the tree tops made us move lively along the crest. One or two shells burst in our ranks. Passing to the southern slope of Little Round Top, Colonel Vincent indicated to me the ground my regiment was to occupy, informing me that this was the extreme left of our general line, and that a desperate attack was expected in order to turn that position, concluding by telling me I was to "hold that ground at all hazards. "This was the last word I heard from him. In order to commence by making my right firm, I formed my regiment on the right into line, giving such direction to the line as should best secure the advantage of the rough, rocky, and straglingly wooded ground. The line faced generally toward a more conspicuous eminence southwest of ours, which is known as Sugar Loaf, or Round Top. Between this and my position intervened a smooth and thinly wooded hollow. My line formed, I immediately detached Company B, Captain Morrill commanding, to extend from my left flank across this hollow as a line of skirmishers, with directions to act as occasion might dictate, to prevent a surprise on my exposed flank and rear. The artillery fire on our position had meanwhile been constant and heavy, but my formation was scarcely complete when the artillery was replaced by a vigorous infantry assault upon the center of our brigade to my right, but it very soon involved the right of my regiment and gradually extended along my entire front. The action was quite sharp and at close quarters. In the midst of this, an officer from my center informed me that some important movement of the enemy was going on in his front, beyond that of the line with which we were engaged. Mounting a large rock, I was able to see a considerable body of the enemy moving by the flank in rear of their line engaged, and passing from the direction of the foot of Great Round Top through the valley toward the front of my left. The close engagement not allowing any change of front, I immediately stretched my regiment to the left, by taking intervals by the left flank, and at the same time "refusing" my left wing, so that it was nearly at right angles with my right, thus occupying about twice the extent of our ordinary front, some of the companies being brought into single rank when the nature of the ground gave sufficient strength or shelter. My officers and men understood my wishes so well that this movement was executed under fire, the right wing keeping up fire, without giving the enemy any occasion to seize or even to suspect their advantage. But we were not a moment too soon; the enemy's flanking column having gained their desired direction, burst upon my left, where they evidently had expected an unguarded flank, with great demonstration. We opened a brisk fire at closes range, which was so sudden and effective that they soon fell back among the rocks and low trees in the valley, only to burst forth again with a shout, and rapidly advanced, firing as they came. They pushed up to within a dozen yards of us before the terrible effectiveness of our fire compelled them to break and take shelter. They renewed the assault on our whole front, and for an hour the fighting was severe. Squads of the enemy broke through our line in several places, and the fight was literally hand to hand. The edge of the fight rolled backward and forward like a wave. The dead and wounded were now in our front and then in our rear. Forced from our position, we desperately recovered it, and pushed the enemy down to the foot of the slope. The intervals of the struggle were seized to remove our wounded (and those of the enemy also), to gather ammunition from the cartridge-boxes of disabled friend or foe on the field, and even to secure better muskets than the Enfields, which we found did not stand service well. Rude shelters were thrown up of the loose rocks that covered the ground. Captain Woodward, commanding the Eighty-third Pennsylvania Volunteers, on my right, gallantly maintaining his fight, judiciously and with hearty co-operation made his movements conform to my necessities, so that my right was at no time exposed to a flank attack. The enemy seemed to have gathered all their energies for their final assault. We had gotten our thin line into as good a shape as possible, when a strong force emerged from the scrub wood in the valley, as well as I could judge, in two lines in echelon by the right, and, opening a heavy fire, the first line came on as if they meant to sweep everything before them. We opened on them as well as we could with our scanty ammunition snatched from the field. It did not seem possible to withstand another shock like this now coming on. Our loss had been severe. One-half of my left wing had fallen, and a third of my regiment lay just behind us, dead or badly wounded. 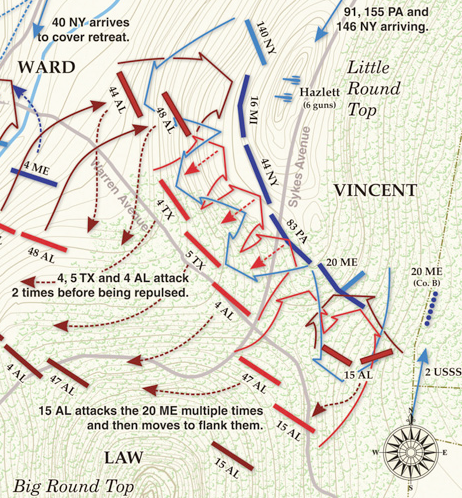 At this moment my anxiety was increased by a great roar of musketry in my rear, on the farther or northerly slope of Little Round Top, apparently on the flank of the regular brigade, which was in support of Hazletts battery on the crest behind us. 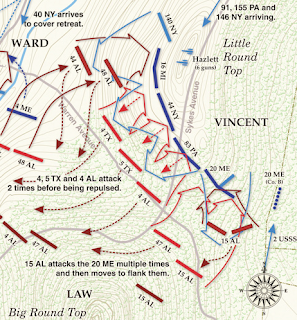 The bullets from this attack struck into my left rear, and I feared that the enemy might have nearly surrounded the Little Round Top, and only a desperate chance was left for us. My ammunition was soon exhausted. My men were firing their last shot and getting ready to "club" their muskets. It was imperative to strike before we were struck by this overwhelming force in a hand-to-hand fight, which we could not probably have withstood or survived. At that crisis, I ordered the bayonet. The word was enough. It ran like fire along the line, from man to man, and rose into a shout, with which they sprang forward upon the enemy, now not 30 yards away. The effect was surprising; many of the enemy's first line threw down their arms and surrendered. An officer fired his pistol at my head with one hand, while he handed me his sword with the other. Holding fast by our right, and swinging forward our left, we made an extended "right wheel, " before which the enemy's second line broke and fell back, fighting from tree to tree, many being captured, until we had swept the valley and cleared the front of nearly our entire brigade. Meantime Captain Morrill with his skirmishers (sent out from my left flank), with some dozen or fifteen of the U. S. Sharpshooters who had put themselves under his direction, fell upon the enemy as they were breaking, and by his demonstrations, as well as his well-directed fire, added much to the effect of the charge. Having thus cleared the valley and driven the enemy up the western slope of the Great Round Top, not wishing to press so far out as to hazard the ground I was to hold by leaving it exposed to a sudden rush of the enemy, I succeeded (although with some effort to stop my men, who declared they were "on the road to Richmond") in getting the regiment into good order and resuming our original position. Four hundred prisoners, including two field and several line officers, were sent to the rear. These were mainly from the Fifteenth and Forty-seventh Alabama Regiments, with some of the Fourth and Fifth Texas. One hundred and fifty of the enemy were found killed and wounded in our front. At dusk, Colonel Rice informed me of the fall of Colonel Vincent, which had devolved the command of the brigade on him, and that Colonel Fisher had come up with a brigade to our support. These troops were massed in our rear. 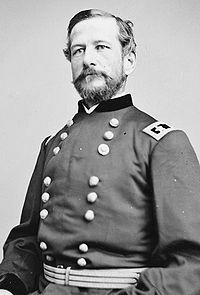 It was the understanding, as Colonel Rice informed me, that Colonel Fishers brigade was to advance and seize the western slope of Great Round Top, where the enemy had shortly before been driven. But, after considerable delay, this intention for some reason was not carried into execution. We were apprehensive that if the enemy were allowed to strengthen himself in that position, he would have a great advantage in renewing the attack on us at daylight or before. Colonel Rice then directed me to make the movement to seize that crest. It was now 9 p. m. Without waiting to get ammunition, but trusting in part to the very circumstance of not exposing our movement or our small front by firing, and with bayonets fixed, the little handful of 200 men pressed up the mountain side in very extended order, as the steep and jagged surface of the ground compelled. We heard squads of the enemy falling back before us, and, when near the crest, we met a scattering and uncertain fire, which caused us the great loss of the gallant Lieutenant Linscott, who fell, mortally wounded. In the silent advance in the darkness we laid hold of 25 prisoners, among them a staff officer of General [E. M. ] Law, commanding the brigade immediately opposed to us during the fight. Reaching the crest, and reconnoitering the ground, I placed the men in a strong position among the rocks, and informed Colonel Rice, requesting also ammunition and some support to our right, which was very near the enemy, their movements and words even being now distinctly heard by us. Some confusion soon after resulted from the attempt of some regiment of Colonel Fishers brigade to come to our support. They had found a wood road up the mountain, which brought then on my right flank, and also in proximity to the enemy, massed a little below. Hearing their approach, and thinking a movement from that quarter could only be from the enemy, I made disposition to receive them as such. In the confusion which attended the attempt to form them in support of my right, the enemy opened a brisk fire, which disconcerted my efforts to form them and disheartened the supports themselves, so that I saw no more of them that night. Feeling somewhat insecure in this isolated position, I sent in for the Eighty-third Pennsylvania, which came speedily, followed by the Forty-fourth New York, and, having seen these well posted, I sent a strong picket to the front, with instructions to report to me every half hour during the night, and allowed the rest of my men to sleep on their arms. At some time about midnight, two regiments of Colonel Fishers brigade came up the mountain beyond my left, and took position near the summit; but as the enemy did not threaten from that direction, I made no effort to connect with them. We went into the fight with 386, all told-358 guns. Every pioneer and musician who could carry a musket went into the ranks. Even the sick and foot-sore, who could not keep up in the march, came up as soon as they could find their regiments, and took their places in line of battle, while it was battle, indeed. Some prisoners I had under guard, under sentence of Court-Martial, I was obliged to put into the fight, and they bore their part well, for which I shall recommend a commutation of their sentence. The loss, so far as I can ascertain it, is 136-30 of whom were killed, and among the wounded are many mortally. Captain Billings, Lieutenant Kendall, and Lieutenant Linscott are officers whose loss we deeply mourn-efficient soldiers, and pure and high-minded men. In such an engagement there were many incidents of heroism and noble character which should have place even in an official report; but, under present circumstances, I am unable to do justice to them. I will say of that regiment that the resolution, courage, and heroic fortitude which enabled us to withstand so formidable an attack have happily led to so conspicuous a result that they may safely trust to history to record their merits. 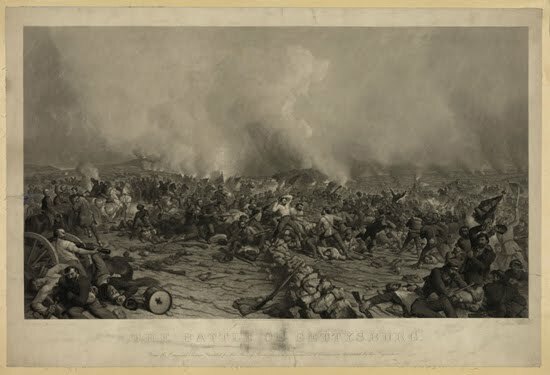 About noon on the 3rd of July, we were withdrawn, and formed on the right of the brigade, in the front edge of a piece of woods near the left center of our main line of battle, where we were held in readiness to support our troops, then receiving the severe attack of the afternoon of that day. On the 4th, we made a reconnaissance to the front, to ascertain the movements of the enemy, but finding that they had retired, at least beyond Willoughby's Run, we returned to Little Round Top, where we buried our dead in the place where we had laid them during the fight, marking each grave by a head-board made of ammunition boxes, with each dead soldiers name cut upon it. We also buried 50 of the enemy's dead in front of our position of July 2. We then looked after our wounded, whom I had taken the responsibility of putting into the houses of citizens in the vicinity of Little Round Top, and, on the morning of the 5th, took up our march on the Emmitsburg road. Colonel, Commanding Twentieth Maine Volunteers.